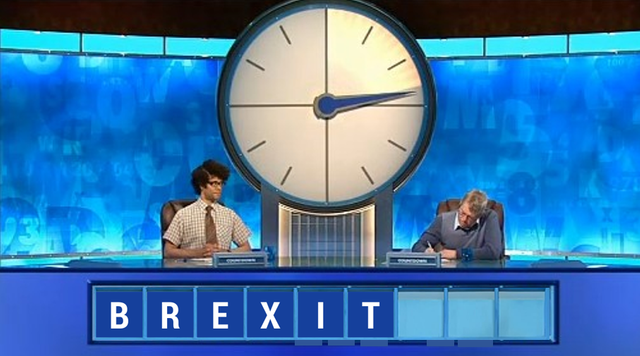 Countdown to Brexit: No Deal or Slow Deal? The UK is due to leave the EU on Friday (12 April). This week is make or break – can a no-deal Brexit on 12 April be averted? If so, what are the terms offered by EU leaders and agreed by UK government and MPs? - MPs again failed to identify a Brexit Plan B that a majority could support as an alternative or supplement to the Withdrawal Agreement the government negotiated with the EU (which MPs rejected for a third time on 29 March). - Theresa May, the UK Prime Minister, concluded that a no-deal Brexit should be avoided at all costs, despite support for no-deal amongst some of her cabinet. I was told by a Cabinet minister that she swung against a no-deal Brexit due to concerns that it would put at risk the union of Great Britain and Northern Ireland (it might precipitate the separation of Northern Ireland and possibly Scotland from the UK). - The Prime Minster and government accepted that parliamentary arithmetic means they cannot pass the Withdrawal Agreement (which needs to be approved by parliament to avert no-deal and ensure an orderly transition to Brexit) without reaching out to the Labour opposition. Talks between the Government and Labour leadership began to try to identify an agreed option that a majority of MPs could support alongside the Withdrawal Agreement. - Whilst this has created apoplexy amongst some Conservative MPs, it is also designed to pin the blame on the Labour party for whatever may happen next. As a government minister said to me: “Labour have sat on the fence too long” and formal talks with Labour will help to “call them out”. - Options being discussed between the Government and Labour include a possible second referendum and a commitment to the UK being in a custom union with the EU. Earlier in the week, MPs came within three votes of supporting a customs union. My colleague Tom Rathborn has produced a great guide to what this would mean: Understanding Brexit: customs union, based on discussion with our customs experts. The headline is that a customs union does not create frictionless trade and only applies to goods (it does nothing for services). - Meanwhile backbench MPs, led by Yvette Cooper and Sir Oliver Letwin, took matters into their own hands by steering emergency legislation through the House of Commons, designed to reduce the risk of a no-deal Brexit next week. The legislation requires the Government next week to seek Parliament’s agreement to ask the EU for an extension to article 50 (including agreement to the length of extension) in order to delay Brexit; and if the EU proposes a different date, the bill requires the Government to seek Parliament’s approval to this too. Note that this does not in itself prevent a no-deal Brexit and it could even make matters more complicated in the next week. This legislation is expected to be approved by the House of Lords and become law on Monday. - Today Theresa May got ahead of this and wrote to Donald Tusk, the EU President, requesting an extension of article 50 until 30 June 2019. - The Government began preparations to hold European Parliament elections – a condition set by EU leaders for any delay to Brexit beyond 12 April. Talks between the Labour party and the Government continue, and Government is expected to set out proposals for options they will ask MPs to vote on next week. This vote will be Tuesday at the earliest. On Wednesday EU leaders meet and will decide on whether they agree to an extension to article 50 and if so, over what period and with what strings attached. Indications are that they may consider a ‘flextension’ – a one-year extension, which can be shortened if and when the UK agrees to the withdrawal agreement and completes legal ratification. This emergency summit of EU leaders on Wednesday 10 April (meetings starts 6pm) is the key decision point. What happens next ultimately rests in their hands. We will then need to see how the UK Government and Parliament react. No-deal Brexit (trading on WTO terms with no transition) at 11pm on 12 April remains the default. There are a lot of things that need to happen in the next week to avert this. 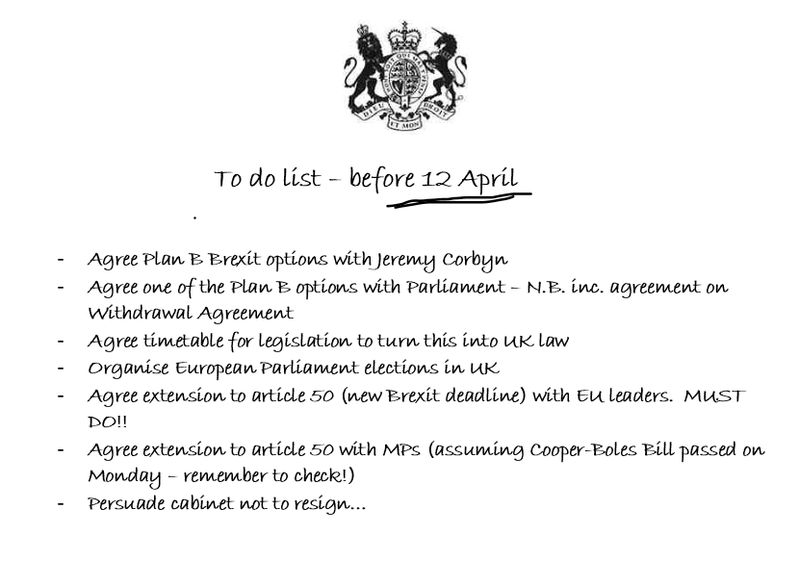 Here is Theresa May’s to-do list for the next week if she is to avert no-deal Brexit. 1. Be prepared for no-deal on Friday 12 April. Here's our Brexit Essentials guide. 2. With Easter holidays starting, organisations need to ensure they have cover arrangements for the next two weeks that enable them to take decisions and activate Brexit plans: make sure your Brexit committee or board can still meet to review developments next week; that governance is in place to enable emergency decisions to be taken over the next week; and make sure all team roles required for no-deal plans have holiday cover and are fully briefed on the plan. 3. The EU council on Wednesday should be the decisive point for whether or not no-deal will happen on 12 April. Organisations should review Brexit plans on Wednesday night or Thursday morning. No-deal Brexit (trading on WTO terms with no transition) at 11pm on 12 April remains the default. There are a lot of things that need to happen in the next week to avert this. The emergency summit of EU leaders on Wednesday 10 April is the key decision point. What happens next ultimately rests in their hands. What do we do with our no-deal plans? The Brexit voyage: where next?